Over the past month the Animal Liberation Sanctuary in Nepal has welcomed a few new four-legged friends rescued from being killed for meat. These goats are currently in quarantine at Kachoe Ghakyil Ling Nunnery until they are clear to join the main herd. 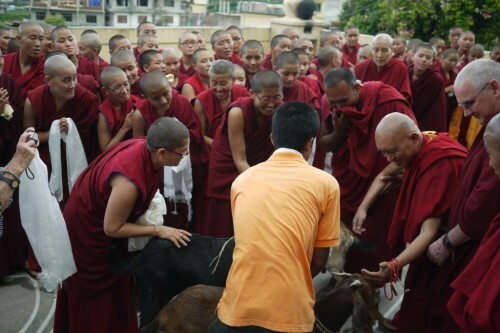 Lama Zopa Rinpoche himself has rescued most of these animals and recently they were fortunate to receive a personal visit from Rinpoche. Rinpoche not only blessed the animals (the nunnery’s dogs also came for a listen) but did extensive sutra recitation for them as well. Please go to the Enlightenment for the Dear Animals’ Facebook page to see even more photos of this wonderful event.